Sikkim is regarded as a state (in north-eastern India) where Mother Nature eternally smiles. This state is blessed by the beauty of eastern Himalaya and popular for the view of snowcapped mountains like Mt. Kanchenjungha, Mt. Pandim, Mt. Kabru North, Mt. Kabru, South, Mt. Kabru South, Mt. Narsingh and many other glorious snow peaks, dense alpine forests, colorful flowers, waterfalls, picturesque villages and last but not the least warm nice villagers. Though there are many popular and crowded tourist spots like Pelling, Gangtok, Rinchengpong, Ravangla etc., personally I love to go to the remote villages of Sikkim. This is because I am much more interested to enjoy the nature and the calmness of unknown places refreshes my mind. Invariably I have seen that the unknown places have some hidden natural treasure that common people usually do not know. 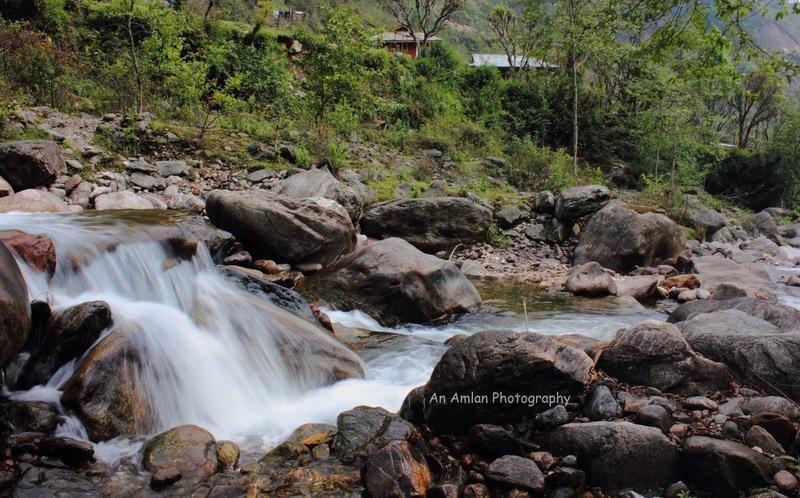 In this post I am going to say about a small village of Sikkim names Uttarey. Located in the northern slope of Singalila Range, the small settlement of Uttarey at West Sikkim is an ideal gateway for the tourists. 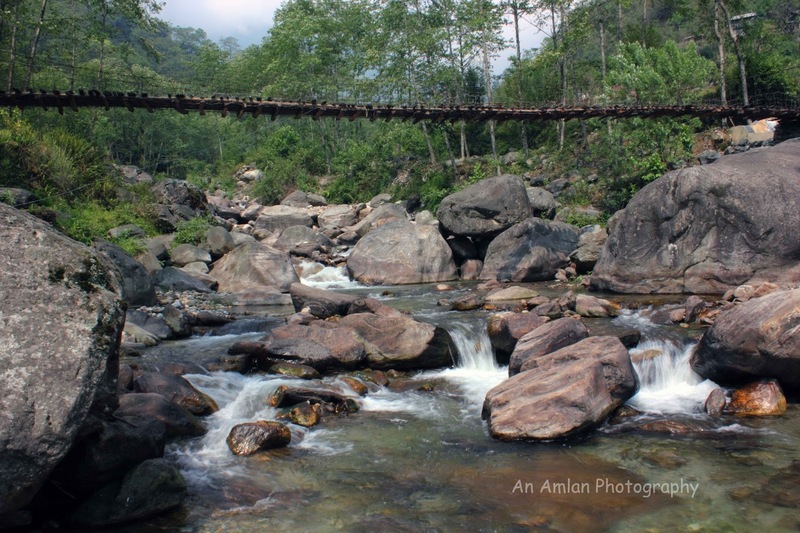 On the bank of Simphok Khola River, the hamlet is blessed by the beauty of green mountains enriched with the wilderness of Singalila National Park and dreamy atmosphere. The behavior and hospitality of the local villagers makes the trip more pleasant. Uttarey is famous for its tranquility and natural beauty. During winter the mountains around here are covered with snow allowing heavenly views. This place is ideal for taking small hikes or moderate treks to refresh your soul. Usually people who go are interested to visit south or west Sikkim is suggested to add Uttarey in their itinerary. To reach Uttarey, Singshore Bridge needs to be crossed. Singshore Bridge is one of the star attractions of Uttarey. A great example of engineering, the bridge is the only gateway to this settlement by road. 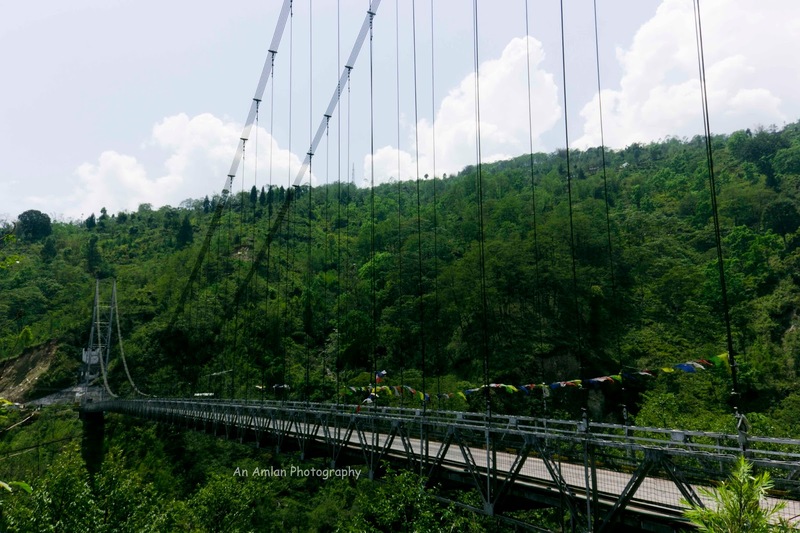 This is the second highest gorge bridge (almost 100 meters high) of Asia. We reached Uttarey at 2pm, checked into the hotel, had lunch and came out to walk through the village. It was a pleasant experience to roam around the village. Since I am a street photographer, I enjoyed it a lot. As I got some frames of local villager. Unfortunately rain came and we took shelter inside a hut. We started chatting with the owner of the hut with the tea. Later the owner of the hut managed umbrella and took us to the hotel. Next day, though it was raining, we decided to go to the Mainbaas Waterfalls. This is the main attraction of Uttarey and located at a distance of 4 km from Uttarey. In local dialect, “Main Baas” means honeycomb. Lots of honeycombs are found beside the magnificent waterfall. First we trekked up to the trout cultivation centre, run by the fisheries department of the state government. It was just one kilometer trek. Then we started to trek more. The trek route was awesome. Dense forest was on our left side, and the river was on our right side. After walking 2 kilometer we crossed the river and went inside the dense forest of Barsey Rhododendron Sanctuary. Our guide asked us not to take gap between us as there is a chance to get out of the track. And since it was raining, we won’t get able to track if somebody misses the trail, moreover there are beer and leopard. We got a bit scared but enjoyed the trail a lot. I think, the trek route through Barsey rhododendron sanctuary during the month of April must be a feast for the eyes. After walking 1 kilometer, we reached at Mainbaas Waterfalls. The beauty of the falls cannot be expressed in words. It was a gigantic one. Honeycombs were found here and there. For tourists interested in more adventure, can further trek to the top of the Singalila Riadge via Chitrey and Chiwyabhanjan pass through Barsey rhododendron sanctuary. But for that trek, the team must be well equipped with tents, sleeping bags, ration. It was not in our itinerary, so we came back to Uttarey by the same route. We had a wonderful lunch at hotel and got ready for going to visit to Kagju Gompha (or Kagyu Gompha). But due to heavy shower a local villager asked us not to start. As the Samaritan strongly discouraged us, we decided not to go there instead we heard stories about that place. The villagers believe that the immortal soul of their dead family members stay there. This is a very revered place of worship for local villagers. The ruins of the monastery were very much in sight up to 1982. The monastery was rebuilt with the relics found around the place. The wall paintings are an example of the cultural enrichment of Buddha religion. It is strongly believed amongst the locals that there are hidden sculptures buried in the earth near this holy structure. It is a historical fact that King Tensung Namgyal of Sikkim married Princess Mukma Hangma, daughter of Yomo Hang, the Limboo King of Aruntambar of Nepal. Ancient history of Sikkim claims that the couple with its entourage walked through this Uttarey Valley. Durga Mandir is also a holy place that can be visited with a small walk. There is a belief among the local villagers that there was a huge pokhri (lake) in Uttarey Valley which has now dried up over the period. It is heard from the octogenarians that this pokhri was called the justice lake. From Siliguri take a car to Jorethang, Pelling or Rinchenpong. From there, hire a car to Uttarey. Or there are shuttle car from Jorethang to Uttarey. Eco-tourism has been developed in this village. Tourists, who like nature, will enjoy the eco-tourism in this dreamy place. Nagbeli Hotel and Resort is a nice hotel for staying. This was so fascinating to read! I had no idea about the the legends and stories of this place, or to be honest, much about this area at all. Waterfalls look lovely, and I definitely want to go to that sanctuary! Uttarey looks so out of the world and picturesque. I have been to Pelling and Ravangla but have missed this place. Hope to get there next time. 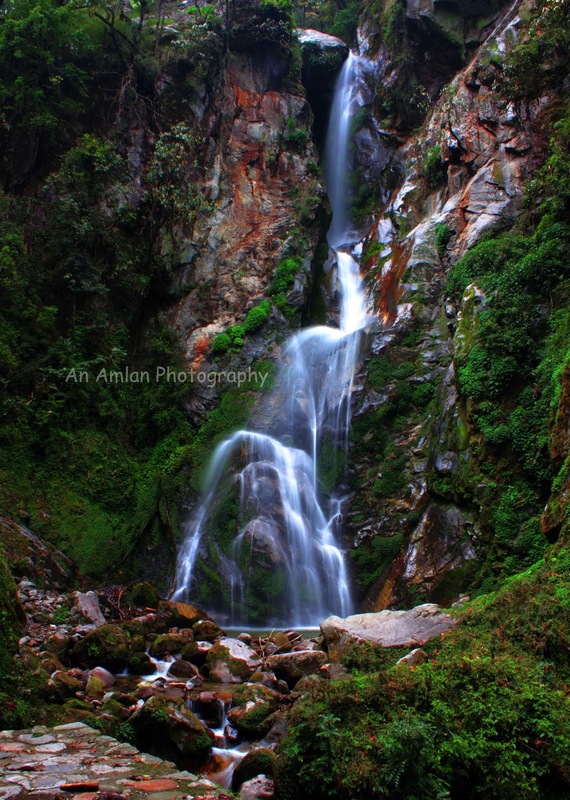 We had a really great time in Sikkim amidst the lush lanndscapes. We are yet to explore North East India, its gem of a place for travellers. Uttarey looks stunning and enticing with lush green landscapes and the waterfalls. Have always wanted to visit the North East.This town looks such a nice peaceful place to camp and mingle with the locals.Thanks for bringing Uttarey to our notice. I love the small towns and villages too. It sounds idealic.